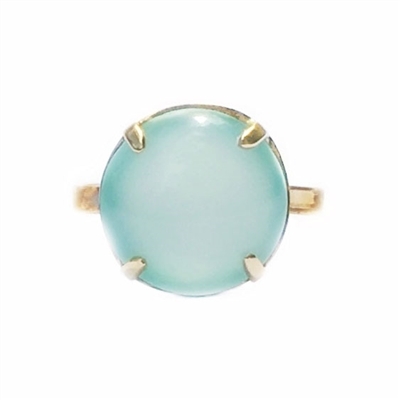 A bezel set natural Peruvian opal ring in 14k gold fill, as shown, or in sterling silver. Each opal is free form in shape, unique and has a beautiful sea green color. 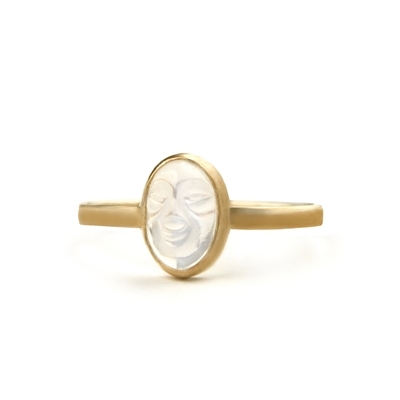 A limited edition14k gold filled ring of a bezel set vintage carved mother of pearl moonface..
A 14k gold filled ring with an prong set, brightly colored natural gemstone. A soft top faceted cushion shaped gemstone prong set ring. Available in sterling or 14k gold filled, as shown in labradorite. 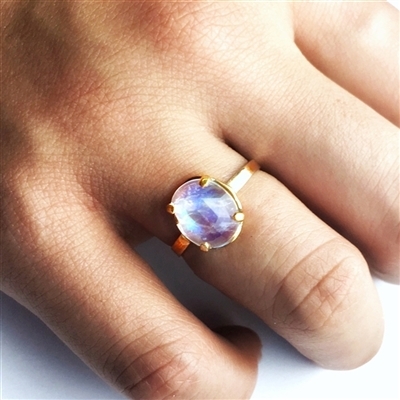 A vintage style rose cut (top faceted) rainbow moonstone ring available in sterling silver or as shown in 14k gold filled. 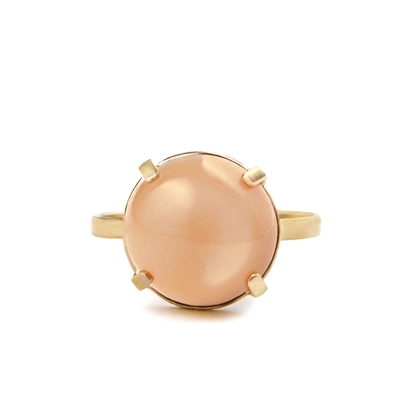 A 14k gold filled ring of a large prong set cabochon gemstone. Available in peach moonstone or labradorite. 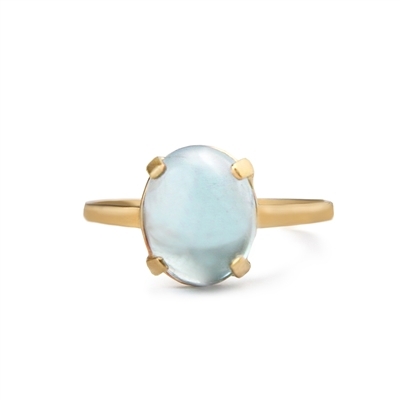 A round Peruvian chalcedony prong set ring. Available in sterling or 14k gold filled, as shown. A natural opal is prong set in 14k gold fill or sterling silver. Available in natural Peruvian opal or Australian opal triplet. Each opal is free form in shape, unique and has a beautiful color. Prong set solid Mintabie opal ring. Available in sterling silver or as shown in14k gold filled. Each stone is one of a kind and is approximately 12x10mm (1/2" inch). Handmade in the USA. 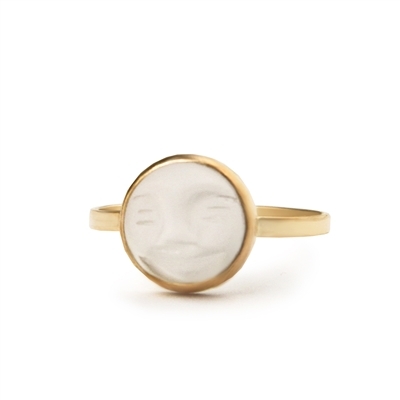 This 14k Gold filled ring features a rare vintage ceylon blue moonstone carved moon face. Each stone has beautiful flashes of bright blue and are limited edition. 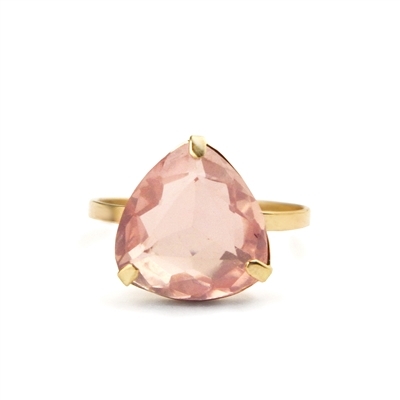 This 14k Gold filled ring features a prong set large faceted gemstone. Available in rose quartz or amethyst. Each gemstone is of the finest quality and color. Shapes will vary.